U.S. 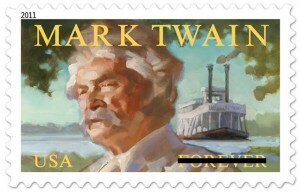 Postal Service Mark Twain (Forever) commemorative stamp. Commemorative coins in gold and silver will honor the author and humorist in 2016. On December 4, 2012, President Obama signed the Mark Twain Commemorative Coin Act into law. The Act directs the Treasury Secretary, and thereby the United States Mint, to produced up to 100,000 $5 gold commemorative coins and up to 350,000 $1 silver commemorative coins for distribution and sale during calendar year 2016. Struck in collector proof and uncirculated qualities, designs on the coins will be emblematic of the life and legacy of Mark Twain. Twain, the noted 19th century author and humorist, was the pen name of Samuel Clemens. Clemens was responsible for such classics as The Adventures of Tom Sawyer and its sequel The Adventures of Huckleberry Finn. The proof and uncirculated $5 gold and silver dollars will get produced to the same standard specifications of other modern U.S. commemorative coins. The gold coins must be struck to a weight of 8.359 grams, a diameter of 0.850 inches and composition of 90% gold and 10% alloy. The silver dollars must be struck to a weight of 26.73 grams, a diameter of 1.50 inches and composition of 90% silver and 10% copper. The Act states that only one facility of the U.S. Mint may produce any particular quality. Designs for the commemorative coins will be created by U.S. Mint selected artists and reviewed by the Citizens Coinage Advisory Committee. The Treasury Secretary is responsible for making the final selections after consulting with the Commission of Fine Arts and the Board of the Mark Twain House and Museum. The Mark Twain Commemorative Coin Act, numbered H.R. 2453, was introduced in the House on July 7, 2011 by Rep. Blaine Luetkemeyer of Missouri. A nearly identical bill, numbered S. 1929, was brought forward in the Senate on November 30, 2011 by Sen. Richard Blumenthal of Connecticut. "I want to thank the president for signing this legislation into law and I appreciate the efforts of all the folks back home that have worked so hard for so long to make this day possible," Luetkemeyer said December 5, 2012 in a statement. "Twain’s Boyhood home attracts people from all over the world and brings much-needed jobs and economic development to the state and this law will certainly boost those efforts." H.R. 2453 passed in the House on April 18, 2012 and made its way to the Senate where two amendments were added and passed on September 22, 2012. The amendments pertained to the use of the surcharges and ensuring that no net cost to the government would result in minting and issuing the commemorative coins. The House agreed with the amended version on November 15, 2012 and it was presented to the President in late November. "Mark Twain is an American icon with deep roots and a proud history in Connecticut," Senator Blumenthal said in a statement after Congress passed the legislation. "People of all ages from every corner of the globe seek to learn from Twain’s literary works, wisdom, and wit each day. This bill commemorates his cultural and historic legacy and empowers those organizations most committed to preserving it." Sales of the commemorative coins will begin no earlier than January 1, 2016 and their issuance must stop by the end of December 2016. I wonder what currency we will be using in four years, to pay for these coins. Rubles, Yuans? Mark Twain was an atheist & would get a hoot out of that irony! The coins will indeed include the inscriptions of ‘In God We Trust’, as well as ‘2016’, ‘Liberty’ ‘United States of America’, ‘E Pluribus Unum’ and the value of the coin. Mark Twain was most definitely NOT and atheist! Rather he hated religions’ distorted view of God. He thought the Old Testament reveled a god with an extreme anger-management problem desperately needing religion. He dislike the New Testament god for bring eternal damnation to human kind for committing petty offenses. He didn’t reject the real God, the creator of the universe and all there is. He thought that we human beings such small little small creatures living on a small blue planet on the outskirts of a mediocre galaxy couldn’t hope to understand the real God. He rejected our pathetic invented of a puny god who had all the weaknesses and lack of morality as the human race. I’m trying to figure out why 2016. it’s not a 100th anniversary of anything related to Twain. And why not Samuel Clemens? Stupid Congress probably thinks Mark Twain was a real person and not just a pen name. I certainly hope the US Mint designers can come up with good representations. A head shot like we’ve been getting for the $1 president coins would be a good start for both the gold and silver coins. “IN GOD WE TRUST” All others pay cash. Samuel Clemens trained and became a riverboat captain. Mark Twain is a riverboat term indicating a certain amount of depth to the water where it was safe to take a boat. The man reading the rope in the water would yell “mark twain”, etc. Clemen’s teacher on the boat had used the name Mark Twain in signing his name in ledgers, pilot boat logs, etc, and after he died, Clemens adopted the name as he appreciated the man who taught him.